Ninh Thuan (VNA) – The 37.6 MW Mui Dinh wind power plant invested in by Germany’s Eab New Energy GmbH was inaugurated in Thuan Nam district of the south-central coastal province of Ninh Thuan on April 10. According to Klaus Dieter Lietzmann, President of EAB Newenergy GmbH, the plant’s construction began in August 2016. It is comprised of 16 E-103 wind turbines – one of the most modern produced by ENERCON GmbH. The project was implemented under the supervision and support of foreign experts. Construction was ensured to meet safety measures and quality in line with Vietnamese and European standards. The plant’s operation is expected to generate about 100 million Kwh of clean power for the national grid. Pham Van Hau, Vice Chairman of the provincial People’s Committee, appreciated the efforts of investors and contractors towards completing the project on schedule. 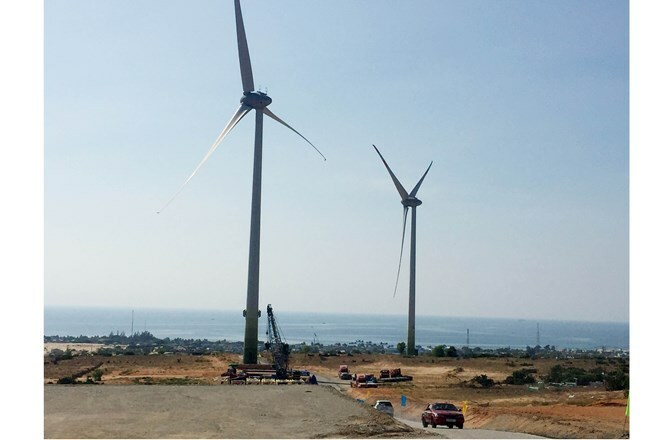 This is the second wind power project in Ninh Thuan, creating a breakthrough for socio-economic and renewable energy development, thus contributing to turning the province into a renewable energy hub of the country. Ninh Thuan has attracted many wind and solar power projects, with a combined capacity of 2,800 MW. As many as 18 solar power projects and three wind power plants are under construction in the locality. As scheduled, nine projects with a combined capacity of 600MW will be put into operation this month.